Looking for an affordable place to stay at Disney World? Consider Fort Wilderness Resort & Campground, which offers a way to save on a Disney World vacation, especially if you visit during Disney World's off-season. This outdoorsy resort is a great place for lovers of nature and wildlife, as you'll likely spy deer, ducks, armadillos, and rabbits while visiting. The lakeside resort offers cowboy Western-style themes, plenty of activities, and accommodations in cabins or a campground. Guests get to enjoy all the perks of staying at any Disney World Resort, including access to the free Magical Express airport shuttle, free Disney transportation to theme parks, Extra Magic Hours, and the ability to plan your visit up to 60 days in advance of your stay using the My Disney Experience app and MagicBands. Keep in mind that Disney World is roughly the size of San Francisco and you can spend a lot of time getting from your resort to the various theme parks if you stay too far from the action. Fort Wilderness has a good location, especially for visits to the Magic Kingdom theme park; a 10-minute ferry goes directly to and from the Magic Kingdom, making for a convenient way to beat the crowds after the nightly fireworks at Cinderella's Castle. The other theme parks can be reached by using the free Disney bus system available at all Disney World resorts. Fort Wilderness is a giant property spanning 750 acres and features a popular dinner show and fun activities such as swimming, wagon rides, archery, horseback riding, and night-time outdoor movies and campfire sing-a-longs. There are also several playgrounds at the resort, fishing cruises out on the lake, and an arcade with video and arcade games. There are several pools, including Meadow Swimmin’ Pool with its corkscrew water slide and hot tub; a fort-themed kiddie water play area with tot-friendly slides; and the more tranquil Wilderness Swimmin’ Pool, an all-ages quiet pool with a hot tub. 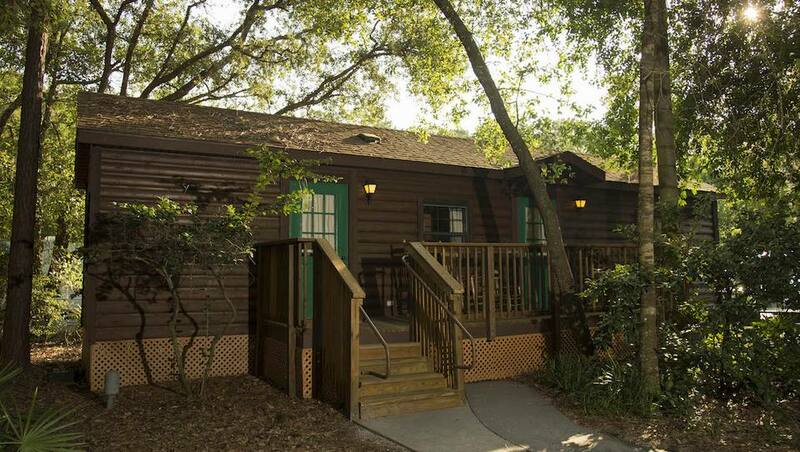 Cabins at Fort Wilderness are basic but comfortable, featuring two bedrooms and sleeping six people on one queen bed, one bunk bed and one double pullout sofa. There is a sitting/dining area with a TV, plus a full bathroom, kitchen, and outdoor grill and patio. Like to camp? Campsites are spread out on many different loops, some with full-service RV hook-ups, some only for tents. And there's a bonus for pet lovers: Fort Wilderness is unique in all of Disney World in that your pet can stay with you at many camping sites. Comfort stations are air-conditioned, spotless, and have private showers, laundry, phones, and ice machines. Two Trading Post general stores sell groceries at reasonable prices. Guests will also find multiple restaurants, including Mickey's Backyard BBQ all-you-can-eat buffet, with a country-style band. The campground offers an excellent economical way to stay on-property and enjoy all the perks of a Disney World resort. You can have groceries delivered to your cabin or campsite.